One fabulous book dictated the rhythm of our summer and formed the soundtrack to our holidays. At around 20 months Culturebaby fell in love with Michael Rosen and Helen Oxenbury's beautiful, clever and addictive 'We're Going on a Bear Hunt'. With its rhythmic text, which can be chanted like a song, simple words and concepts, stunning illustrations and host of little people heading off on an exciting adventure, this book really has it all. Celebrating its 25th Anniversary this year, this illustrated rhyme is a classic and I truly believe no toddler's home should be without it. 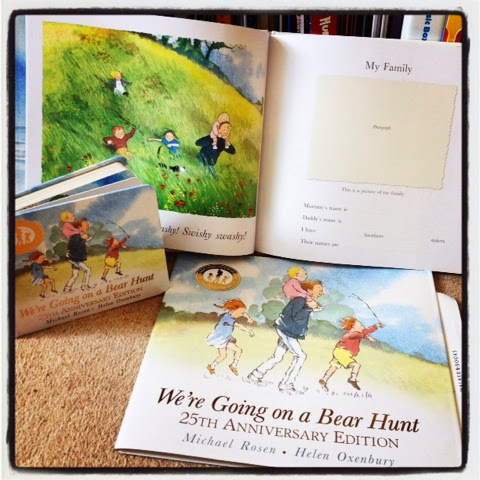 Happily it is now available in a special board book anniversary edition (also smaller and perfect for popping in the bag when you go bear hunting in the wild), and a larger paper version. There's even a Bear Hunt Baby Book. I'm hopeless at starting memory albums and absolutely will be inspired to do this as it will serve as a wonderful reminder of a book so important in the formative months of Culturebaby's language development. We spent much of our summer holidays bear hunting. As the artist John Ruskin noted: “Sunshine is delicious, rain is refreshing, wind braces us up, snow is exhilarating; there is really no such thing as bad weather, only different kinds of good weather." Ruskin lived in the Lake District and as we landed there this August we too experienced almost the full array of possibilities (sans snow). So we donned our macs and wellies and we marched out into the drizzle. Culturebaby was never happier than splashing in puddles, wading through shallow brooks, exploring forests and clambering through vegetation. All the while we chanted about our grizzly goal. Then the following week in Wales, we encountered even more possibilities, and slightly better weather. 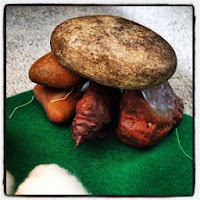 We bear hunted through a huge range of 'caves': Castles and ruined palaces with their dark nooks and crannies, Neolithic Monuments with their awe inspiring standing stones, reconstructed Iron Age Houses with real fires, and finally an actual sea cave. Our Bear Hunting became a game of hide and seek, Daddy morphed into "Daddy Bear". 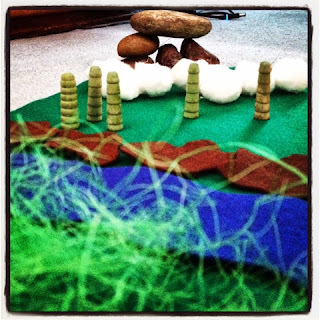 It really was a fabulous way to help Culturebaby explore her environment and bring joy to even the soggiest ramble. Back then, I was amazed at how many times this little book was requested again and again. It came with us everywhere, and we had a mild panic when we thought we'd forgotten it in our holiday packing. (Happily we hadn't). Now at two and a half, Culturebaby still adores this book and can complete every line. She also loves little things, and is really engaged with imaginative play landscapes, so I've created a simple felt bear hunt for us to explore together. 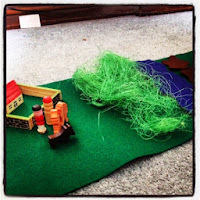 This is so easy to put together with simple things from around the home and a packet of felt. I'm no domestic goddess, but this is easily achievable for anyone and is one further way to bring the book alive. 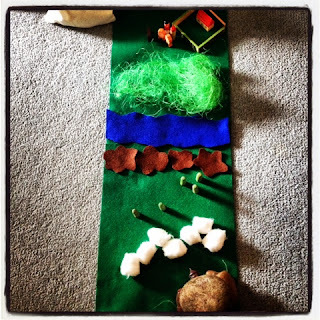 "We're going on a bear hunt, we're going to catch a big one. What a beautiful day! We're not scared. Uh huh. Spots, red and icky pox! We can't go over it, we can't go under it. Oh No! We've got to go through it. Spot, itch, calamine. Spot, itch, calamine. We're going on a bear hunt, the pox have finally cleared up. What a beautiful day! We're not scared! Uh huh. Rain, ridiculous amounts of rain. We can't go over it, we can't go under it, and frankly we can't go out in it. We're going on a bear hunt, the sun has almost come out. What a beautiful day! We're not scared! Uh huh. More pox! Little baby pox! Calamine and no sleep. Cabin fever and no sleep. We're going on a bear hunt, we're going to catch a big one. What a beautiful day! We're not scared! We can't go over it. We can't go under it. Oh no! We've got to go through it. Go downstairs, lock the door, back upstairs, under the covers. 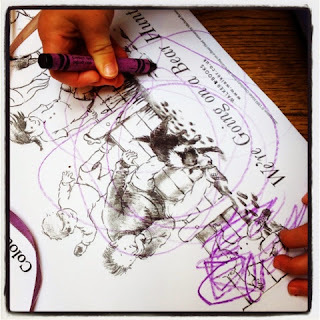 We're not going on a bear hunt today. " 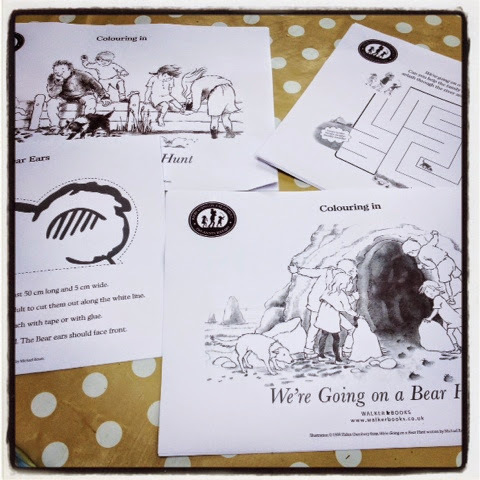 We printed off the free activity sheets from the fabulous bear hunt anniversary website. These range from colouring for tots through mazes and a make-your-own bear ears. 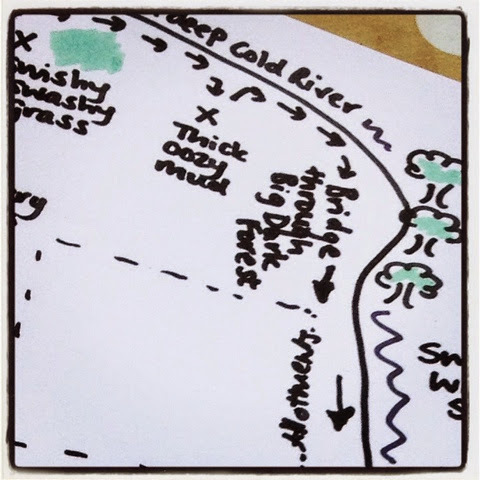 We created a laminated map of the area. The only environment we didn't have was snow, so we planned on sticking up some customised doilies. 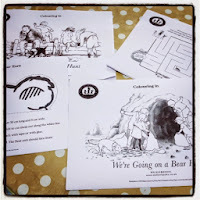 We printed and laminated some bear hunt signs to stick up in each environment for the tots to find. Frankly, there is little that Culturebaby enjoys more than 'finding things' when we are out and about or visiting museums, so this will be the perfect activity for her and her pals. We got as far as the cakes and activity sheets, but the bear hunt itself can wait for the next beautiful, (contagious) illness-free day. This book continues to endure, and its publishing phenomenon is no accident. It is a classic. It provides endless play possibilities. Gift this to your children. Watch Michael Rosen and illustrator Helen Oxenbury shed some light on the origins of the story – and how the book could have looked very different had Helen not ignored Michael's original ideas. What a delightful book extension!